My research here at Yale revolves around issues of mapping and representation. In particular, I am interested in how Allied military planners incorporated visualization and computational technologies in deciding how to bomb German and Japanese targets during World War II. What I find fascinating is that data was used or manipulated – made absolute or indisputable – in order to justify not using advanced technologies for target selection. The ugly truth is that Allied policies in favor of accurate target selection were abandoned in favor of a campaign that allowed British and American bomber crews to systematically obliterate urban areas in Europe and Asia. And although the ultimate outcome of such polices led to the use of nuclear weapons against Japan in 1945, there is a sense that some military planners violated one of Tufte’s cardinal rules regarding the display of visual information – they failed to depict data in relation to other data. The above diagram, featured in Peter Galison’s article "War Against the Center", Grey Room 4 (Summer 2001): pp. 7-33, is a chart created by members of the United States Strategic Bombing Survey in 1945. 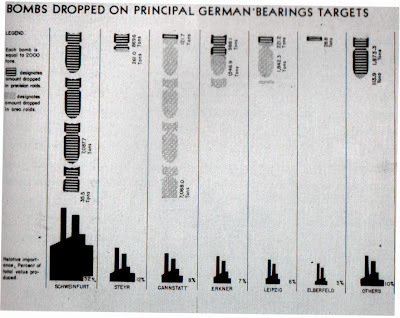 In calculating the effects of precision daylight bombing over European targets, the diagram shows that the majority of bombing attacks on German ball-bearing factories were part of precision (dark cross-hatching) as opposed to area (light cross-hatching) raids. However, the historical record tells us the exact opposite. For example, this diagram does not account for area incendiary raids against nonstrategic targets like Hamburg or Dresden, nor does it account for indiscriminate and collateral civilian casualties. The diagram also depicts the results of American bombing operations in a couple of days. No comparable data appears that depicts the results of British operations. Nor is there any language describing the extremely narrow and limited scope of the diagram. As with the examples iterated by Tufte in Visual Explanations – Dr. John Snow’s mapping of a cholera epidemic, and Morton Thiokol’s diagrams misrepresenting the conditions leading to the o-ring failure, which proved fatal for the Space Shuttle Challenger – the above diagram confirms that“design quality” must indeed stem from “intellectual quality.” If the motives behind the formulation of data are suspect, then the display of that data is equally corrupt.